Trade grew very fast in the ‘long 19th century’ from Waterloo to WWI, recovered from the wartime shock in the 1920s, and collapsed by about a third during the Great Depression. It grew at breakneck speed in the Golden Age of the 1950s and 1960s and again, after a slowdown because of the oil crisis, from the 1970s to the outbreak of the Great Recession in 2007. The effect of the latter on trade growth is sizeable but almost negligible if compared with the joint effect of the two world wars and the Great Depression. However, the effects might become more and more comparable if the current trade stagnation continues. The distribution of world exports by continent and level of development remained fairly stable until WWI. During the Great Depression, Europe lost more than the rest of the world, and the peripheral countries (and Japan) gained, but these changes were largely reversed during the Golden Age of the 1950s and 1960s. Thus, by 1972 European countries and the ‘old rich’ (North Western European countries and the US) still accounted for over a half of world exports. Since then, changes in world shares have been large and, at least so far, permanent. The share of Asia rose from about a sixth to a third, at the expense of all other continents. Contrary to a widely held view, the current level of openness to trade is unprecedented in history. The export/GDP ratio at its 2007 peak was substantially higher than in 1913 and the difference is much larger if the denominators include only tradables (i.e. it is the value added in agriculture and industry). Furthermore, openness increased from 1830 to 1870 (the true first period of globalisation) and again from the mid-1970s to 2007, while it broadly stagnated both in the decades during the so-called first globalisation (1870-1913) and during the Golden Age. Needless to say, openness collapsed during the Great Depression, back to the mid-19thcentury level. The trends in gains from trade, as measured with the Arkolakis et al. (2012) formula, mirror quite closely the movement of openness, with peaks in 1913 (6.3% of GDP, for 36 polities) and 2007 (11.5%). These figures are surely a lower bound of total (static) gains, and in all likelihood the difference between estimated and actual gains was larger in 2007 than in 1913. For the period after 1950, we rely on standard UN data for both GDP and trade, while for pre pre-war years we use our own newly compiled databases. We collected all the available series of GDP at current prices and estimated series of exports and imports by ‘polity’ (i.e., independent countries’ colonies and the corresponding native territories before Western colonisation). Twelve export series start in 1800, and three additional ones in 1813. The number jumps to 28 in 1816 and again to 62 in 1823 and rises to 89 in 1830. 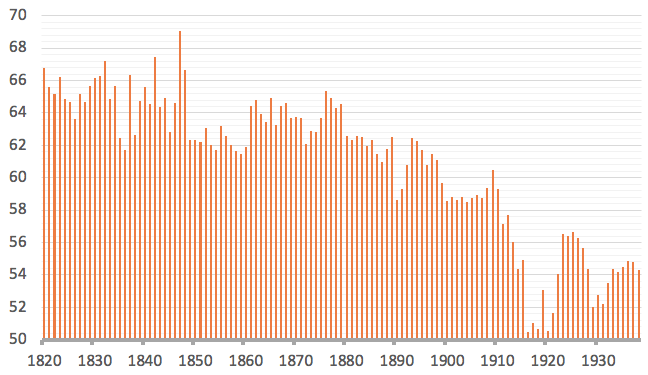 The number of import series grows as well, but remains lower in the first half of the 19thcentury (nine in 1800, 23 in 1823, and 50 in 1830). From 1850 to 1938, the database is complete – i.e. it includes series of imports and exports for all existing polities, with few and insignificant exceptions. Their number varies according to the changes in the political map, ranging between 125 and 130 until 1918, and jumping to around 140 after the Versailles treaty. After 1850, we compute world trade by summing exports by polity, but this method would yield upwardly biased results for the first half of the century. Thus, we extrapolate the 1850 level backwards to 1800 by linking three series for as many time-invariant samples, for 1800–1821 (12 polities), 1823–1829 (62 polities), and 1830–1849 (89 polities). Even the first sample, though small, is representative (62.3% of world exports in 1850), as it includes France, the UK, and the US. The 1823 and 1830 samples are fully representative, accounting respectively for 81.4% and 95.7% of world trade in 1850. None of the previously available series extend so far back in time (they go back, at most, to 1850), nor do they comprehensively cover peripheral countries. 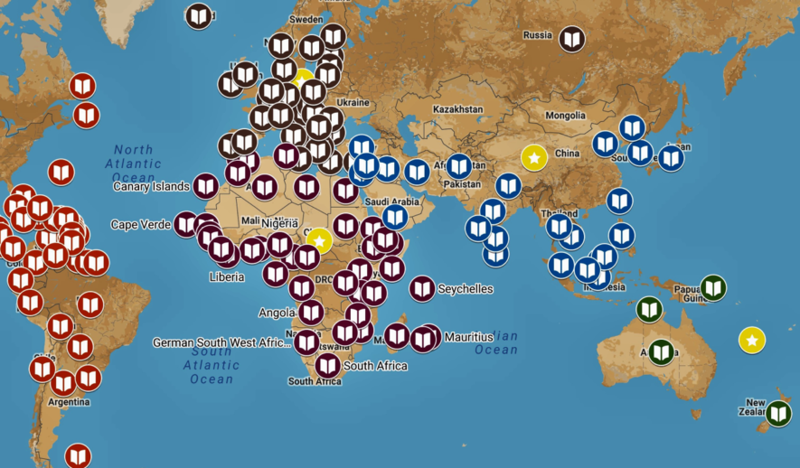 These series, and all data by polity, are now freely available in the Federico-Tena World Trade Historical Database. For each polity (a total of 149) we provide a separate Excel file, which can be easily retrieved from the website by clicking the corresponding button in the Google map (see Figure 2). It is thus possible to study the trade performance of a single polity or of any group of polities of interest. The set includes eight series, for exports and imports at current and constant (1913 dollars) prices at current and constant borders, for a total of 13,075 yearly data for imports and 14,399 for exports and 109,896 observations. We describe in detail the methods and sources of our estimates and assess their reliability in Federico and Tena-Junguito (2016). This paper refers to our main estimate, which was completed in 2014. Since then, we have revised some series to correct errors and to take into account new research made available to us in the meanwhile (information on these changes can be found here). We intend to periodically update the database to correct mistakes and incorporate the results of future research on trade. The next revision is scheduled for October 2020 and we would be grateful for any suggestions. The estimation of polity series has required the collection of a number of additional series, which we also publish on the website. In particular, we publish series of ‘international’ prices for 190 products, as proxied by prices in London or, for manufactures, unit prices of British exports, from 1850 to 1938; of 48 freights rates by product/route from 1800 to 1838; and of exchange rates for diverse years from 1800 to 1938, for 132 countries. Although our main interest is in aggregate trade, we have collected a substantial amount of information about the composition of trade from a number of different sources. Unfortunately, few recent works group products according to modern categories, while contemporary sources use widely different criteria which prevent any analysis of composition beyond the simple distinction between primary products and manufactures. 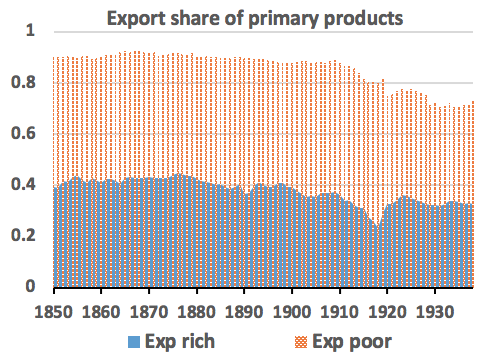 We estimated series of the share of primary products on imports and exports for a growing number of polities, from 25 in 1820, to 110 after 1850. We use these data to estimate a series of world share of primary products from 1820 to 1938, by linking trade-weighted averages for three different time-invariant samples, starting in 1820 (‘1820 sample’, with 23 polities), 1830 (‘1830 sample’, 32 polities) and 1850 (‘full sample’, with 90-110 polities). Source: ‘product composition’ and text. The share of primary products (Figure 3) has been drifting downwards, from about 65% in the 1820s to slightly above 55% on the eve of WWI, with an acceleration of the trend around 1860. This decline continued, albeit very slowly, in the 1920s, while the share rebounded after 1929 back to the level of the early 1910s. As Figure 4 shows, the aggregate share of primary products on exports declined for both rich countries and the rest of the world. Before 1913, the trend by polity was mixed, but the worldwide share declined because of the change in the specialisation of the US. Primary products accounted for four-fifths of American exports before the Civil War and for a third on the eve of WWI and in the interwar years. If the share of primary products on US exports had remained constant since 1850, in 1913 the overall one would have been 62.7% rather than 62.3% – with an increase of 0.45 percentage points instead of the actual decline by 6.3 points. The decline in the share on exports by polity continued in most countries until 1938 – the increase in the worldwide share reflects the growing share of world exports of primary producing polities. Figure 4 highlights another significant divergence from the conventional wisdom. World trade during the first globalisation was not a simple vertical exchange of primary products from the periphery with manufactures from the core countries. 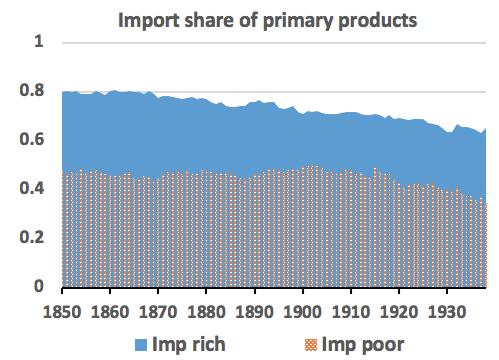 As expected, primary products accounted for most exports of poor countries (on average 86.1% from 1850 to 1938) and for most imports of rich countries (73.6%), but they accounted for about a third of exports from rich countries (38.0%) and for slightly less than half of imports of poor countries (45.5%). Of course, an analysis based only on the aggregate share of primary products barely scratches the surface of the issue. Unfortunately, estimating the changes in composition of world trade, even at the simplest one-digit level, would need a massive research effort. While we await this, our database and the parallel database on aggregate bilateral trade (RICARDO) offer scholars a very valuable resource for historical quantitative analyses of trade – historical comparisons might be useful for understanding current and future trade trends. Arkolakis, C, A Costinot and A Rodriguez-Clare (2012), “New trade models, same old gains?” American Economic Review 102: 94–130. Eichengreen, B and K O’Rourke (2012), “A tale of two depressions redux”, VoxEU.org, 6 March. 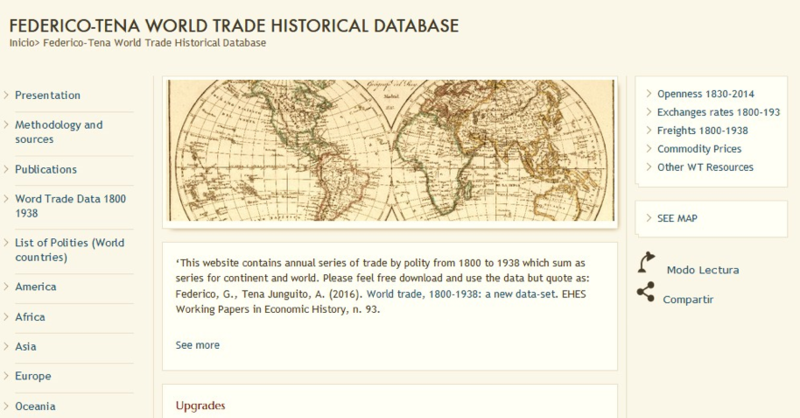 Federico, G and A Tena-Junguito(2016), “World trade, 1800-1938: A new dataset“, EHES, Working papers in economic history 93. Federico, G and A Tena-Junguito(2016a), “World trade, 1800-2015”, VoxEU.org, 7 February. Federico, G and A Tena-Junguito(2016b), “The globalisation in the long run: Gains from trade and openness 1800-2014”, VoxEU.org, 18 April. Federico, G and A Tena-Junguito (2017a), “Lewis revisited: Tropical polities competing on the world market 1830-1938”, Economic History Review 70: 1244–1267. Federico, G and A Tena-Junguito (2017b), “A tale of two globalizations: Gains from trade and openness 1800–2010”, Review of World Economics 153: 601–626. Federico, G and A Tena-Junguito (2018), "American divergence: Lost decades and Emancipation collapse in Latin American and the Caribbean 1820-1870“, European Review of Economic History 22: 185–209.